Wherever you go, however far you think you’ve gone, there’s somebody who calls it home. 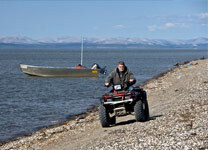 Between the Lake & Peninsula and Bristol Bay boroughs, there are a few thousand somebodies. Whose “backyard” is the Deposit in, and how do they feel about the possibility of a mine coming to the neighborhood? The area around the Pebble Deposit has always been sparsely populated, but it has played a role in the subsistence practices of Yup’ik and Dena’ina people for thousands of years. In Pebble’s Environmental Baseline studies, while archaeological survey teams did not find signs of any settlements, they did identify two prehistoric stone tool production sites along the South Fork Koktuli River, tent ringsalong a ridge of Kaskanak Mountain, the remains of a beachfront hearth and shelter on the Cook Inlet shoreline, and scattered evidence of stone working throughout the area. Today, according to the last census conducted in 2010 as well as the July 2016 census population estimate, the Bristol Bay region of Southwest Alaska is home to roughly 31 communities, ranging from Pope-Vannoy Landing (population 6) to Naknek (population 544). The communities nearest the Deposit are the villages of Nondalton, Newhalen and Iliamna. The Alaska Native people of the area are mostly Central Yup’ik Eskimos and Dena’ina Athabascan Indians, with Alutiiq-speaking people (known as Aleut or Suspiaq) along the coast of Bristol Bay. There is a strong emphasis on maintaining Alaska Native culture and values, and instilling them in the next generation through dance, sport, art, language and traditional practices. 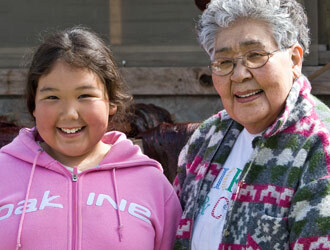 Unfortunately, as of the 2010 census, Alaska Native languages are now only used on an ongoing basis by about 2% of the population in the Bristol Bay Borough, 10% of the population throughout the Lake and Peninsula Borough, and 34% of the population in the Dillingham Census Area. No matter who you are, subsistence hunting, fishing and gathering is very important in daily life throughout the area, with almost everyone participating to some degree. Reliance on—and a relationship with—the land and sea is central to the thousands-year old Alaska Native experience. More than 150 species of wild plants and animals are gathered over the course of the year, contributing significantly to diet and nutrition, to traditional arts and crafts, and to village lifeways. In Newhalen, for example, the average per capita harvest is almost 700 lbs per year. The decline of Alaska Native language use can be attributed in no small part to a shrinking population throughout the region. According to the census July 2016 population estimate this trend continues, dropping from a population of 997 (2010 census) to a population estimated at 898. In the Bristol Bay Borough, population declined 23% from 2000 to 2009; the Lake and Peninsula Borough saw a similar trend with an overall population decline of 15%. School enrollment—a key indication of how many young families remain in the area—has drastically declined in recent years. Between 1997 and 2010, school enrollment in the Bristol Bay Borough fell by 55%, and 36% in the Lake and Peninsula Borough. Jobs that could help that young, able-bodied population remain in their villages, raise families and thrive, while continuing to be an active part of the communities that their parents, grandparents and ancestors built. Because these communities aren’t connected to Alaska’s road system, everything—including oil to heat homes and diesel to generate electricity—must be brought in by boat or small plane. Transporting things this way means that fuel costs twice what it does in Anchorage. That, and the increased price of even the most basic staple goods, contributes to the daily squeeze that residents feel. In addition to building a transportation route connecting several villages to a deepwater port (and in the process lowering bulk transportation costs for almost everything consumed in the region), the Pebble Mine will need a lot of electricity. The current draft plan aligns with public policy prioritizing development of low-cost energy for rural Alaska. Pebble is very interested in working with government and other groups to energize Southwest Alaska with affordable low-cost electrical power or natural gas energy, with great potential to lower current village prices approaching .80 cents per KW/H. Compared to the mine’s needs, village electrification would be just a drop in the bucket, but as a low-cost energy source, its impact on household budgets could mean the difference between a family’s staying in the community and leaving. Another consequence of the area’s relative isolation is a lack of businesses to provide employment. The three biggest sectors are the salmon fishery, government and tourism, but commercial fishing is highly seasonal work and tourism mostly centers on warm-weather activities like guided sport fishing, hunting and wildlife viewing. Government is the only significant year-round employer. Between them, Alaska Fish and Game, the US Postal Service, law enforcement, the court system, and tribal governments account for an average of 424 jobs in the Lake and Peninsula Borough, and even government employment fluctuates somewhat with the seasons. This lack of employers is another way in which Pebble hopes to make a difference. During its construction phase, the Pebble Mine would generate several thousand jobs, and throughout its initial 20 year operating life will provide for more than 2,000 full-time positions. The Partnership has committed to prioritizing local hiring, providing apprenticeships and on-the-job-training to ensure that as many residents as possible can share in the benefits. And that’s not taking into account the third-party jobs created by contractors, support services and others. We’re proud to support the Alaska Native Science & Engineering Program, through the University of Alaska, to help local youth with an aptitude for the sciences get the higher education necessary for life-long careers in geology, engineering and related fields. Read more about Pebble’s Programs here. Of course, to produce the kinds of students who can go on to earn bachelor’s and master’s degrees, as well as PhDs in the sciences, communities need strong primary and secondary schools. That’s why Pebble is a proponent of the Teacher Industry Externship Program and a participant in the public-private partnership that is Alaska Resource Education.